Suburban Construction can help make your home stand out, and provide you a lifetime of durable service with top quality entry door systems. Therma-Tru entry door systems are not only the brand that most builders prefer; they are also unmatched with the best warranties in the industry. Every line of doors we offer comes with a package of performance that is unrivaled in the industry. With a front door by Therma-Tru, not only will you see an increase in comfort, energy efficiency and performance, you will also see an increase in curb appeal. 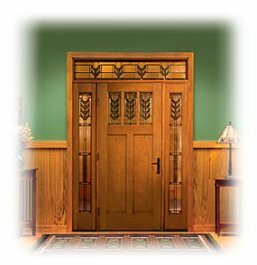 Our fiberglass and steel entry doors will add beauty and security to your home. In fact, you can increase the perceived value of your home by more than $24,000 just by adding a Thema-Tru entry door system. » Why Do Entry Doors Seem to Cost So Much? » ThermaTru Warranty - All units must be painted or stained within 6 months to have the full warranty protection. Please enter the number 15359 in the box provided below.